Whew! I apologize for not posting all week. I'm adjusting to school and let's face it, I'm very good at putting things off. So here we are for another week of The Book Chat. This week, I'm excited to announce that I will begin recruiting co-hosts for the book chat and our first co-host is Miss Brighton of Dear Brighton! Brighton has been participating in the link up for a few weeks now and I just love her enthusiasm for books and blogging. Plus, she's just a super sweet gal who shares many of the same favorites as me. I finally have someone to gush about J.R. Ward novels with, so you guys are off the hook. Please go over and say Hi to Brighton. This is a great topic because sometimes while I'm reading, I get so irked by the littlest things that I start to spur off entire blog posts about it in my head. Those posts never make it to life, so now is the chance! 1. Being clumsy is not a flaw. Why are all teenage girls clumsy? I feel like authors need a way to set their female characters apart from other girls and make them more down-to-earth and relatable, so they make them clumsy. And that's just not enough. 2. On that note, Edward was 90 years old. Did that occur to anyone? Just because his body didn't age doesn't mean he's exempt from being a total creep hitting on 17 year old girls. You were alive during Woodstock, the moon landing and the attack on Pearl Harbor. Imagine a real man who was alive for all of those things and imagine Bella making out with him. Gross. The same goes for a multitude of other YA paranormal novels. Don't mean to pick on Twilight so much. 3. Hard back book covers. What is the purpose of those things? I can't stand them so I just take them off. 4. The person who keeps their library book far, far past the due date when I have a hold on it. I'm talking to you, guy who's had Ender's Game since August. 5. Dying and/or flickering book light. Give me some warning if you're going to crap out halfway into a good chapter. 6. Audiobook readers who feel it necessary to over dramatize the opposite gender's voice. Hearing a male reader read a girl's line in a super high voice sounds like something out of Monty Python. All I'm picturing is a man dressed as a woman. The same goes for females pulling out their baritone for male lines. Just read the damn book. 7. No, Barnes & Noble, I don't have a members card and No, I don't want a members card. Bump your discount up a bit, and maybe it will make me feel like a member, and not a schmuck. 8. Nicholas Sparks movies. We get it, they found love in an unexpected place. Let's move on. 9. Spoilers. Seriously, some people have no restraint. Thanks, it's not like I can un-hear that! 10. Long chapters. I can't just put the bookmark in halfway through a chapter. But if I'm falling asleep and it's another 8 pages to the end, I will torture myself. 11. Loose ends. I love a good ending that wraps everything up nicely where all my questions are answered, and I have closure. It doesn't have to be a happy one, but I hate endings that leave me with so many questions. I'm looking at you, Perks. I'm sure I can think of more. Probably after I read all of yours, I'll think of more. Sorry if that sounded kinda gripey. I've been holding those in for years! It was nice to just get that all out! I seriously cannot wait to read yours. 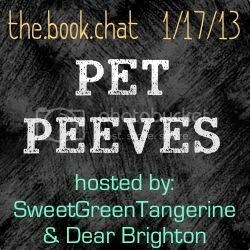 What are some of your bookish pet peeves? It can be anything pertaining to books or reading. It doesn't have to be like mine. I hope you choose to link up! Next week's topic: What are you currently reading? Share your thoughts. If you are interested in co-hosting the book chat, please email me! I'd love to work with you. number 4-- NNNOOOOOOO!!!! Do you have a kindle? I bought it on there and I think I can share it if you have one. I've had someone share a book with me but I've never shared a book with someone else so I'd have to figure out how to do it. number 10- I hate as well. Yet another reason I like Stephen King is because he has great chapter lengths. Sometimes they're only a page or so. Long chapters are my least favorite! And super short chapters can bug me, too. I need them to be just the right length. Ha. I seriously have Ender's Game if you want to borrow it! These all made me smile - because they are all TRUE! I was having a hard time thinking of pet peeves and I almost thought I didn't have any. But these hit the spot! I also hate being asked if I want a card from B&N. Every time! It gets annoying. I'm also over the Nicholas Sparks book turned movie...over and over again. This list made me laugh out loud! I have to confess I am guilty of #4 right now, but I just have to finish the book - it's only a few days overdue! And point #10 - seriously! My husband doesn't understand that I need to get to a stopping point before I stop reading. That's one good thing about The Casual Vacancy, at least! Short chapters. #8 - Oh my god, I just don't GET the Nicholas Sparks obsession. It's the same story in a different place and time! LMAO oh my god this post. I actually couldn't figure out what kind of pet peeves you meant when you created this topic so I didn't write a post! It's only when I read yours that I realize what you meant. I'm going to pull out some bookseller talk on you though (because I can't help defend my peeps and maybe I'll help break one of your pet peeves?) but as for the member card at B&N, we have the same thing at my work. It's not for everyone, but for a long time (until we offered a free card) people would always get angry at me for asking them about it every time they came in and yet they never bought it. As a cashier, you actually get evaluated on how many cards you're able to sell/swipe through your system (you don't get commission, it's just part of your evaluation in order to continue working basically)and if you don't keep a certain percentage on your membership signups/swipes, you get in trouble. At least I know that's how it works at my work, so we make a point of asking every single person. Luckily they created a new program that's free, which people still manage to complain about, but anyway. I understand why it's a pet peeve for many people, but it's just part of the way a company ensures that people come back to buy more (by making you a member) and yeah. Also if the discount isn't very high (what is it like 10%?) it's only because the return on sales is VERY small on books. Book companies already make almost nothing at all- you need to sell a LOT of books to make money- and in the book economy of today that's hard enough. haha I totally love this, spot on! I am a huge reader & would have to agree with the Nicholas Sparks books/movies. Cliche much?? This is a great idea! This is too funny, because as I was reading this I was watching A Walk to Remember with some sisters and complaining about how Nicholas Sparks books only get published because they're by Nicholas Sparks. If anyone else wrote some of the crap he writes these days, it would never get published!